ALAS Qld Welcomes you to the blog! 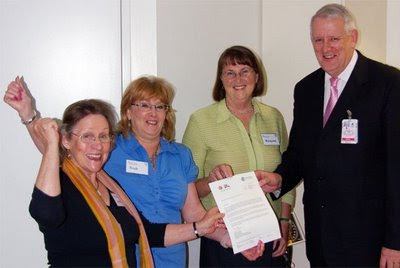 Trish, Janice and Margaret were instrumental in creating this ground breaking occasion, where Professor Jones apologized for the past ill treatment of young single mothers during their pregnancy and confinement in the Royal Brisbane Womens Hospital. 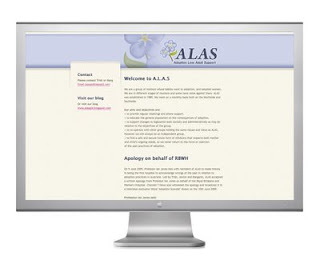 With great pleasure the girls accepted the apology on behalf of ALAS. We believe this is the first time any organization in Australia, and perhaps the world, has officially recognized the cruel practices of the past. Please click on the play button below to watch the video. The official apology handover - History in the making!!! (LtoR) Janice, Trish, Margaret and Professor Ian Jones. Triumphant trailblazers from ALAS receive the official apology from Professor Ian Jones, on behalf of the Royal Brisbane and Women's Hospital. ALAS Qld now have a web presence so that we can be found a little more easily. Keep checking this space for updates on ALAS Qld progress.